The Highland Maple Festival takes place during the second and third weekends of March each year. Highland County, in the Allegheny Mountains west of Staunton, Virginia, bills itself as "Virginia's Switzerland." They don't make maple syrup like this in Switzerland, though. The entire county turns out to celebrate the area's most popular product. The Highland Maple Festival features craft shows, dances, sugar camp tours, music and dance performances, and, of course, food, particularly pancakes with maple syrup. You will need a car to get to the Highland Maple Festival. From the Shenandoah Valley's Interstate 81, you can take either Virginia Route 220 north to McDowell and Monterey or Virginia Route 250 west to Monterey. If you are traveling via Interstate 64, take Route 220 north to Monterey. Highland County is in the heart of the mountains. You will encounter steep, winding roads as you maneuver through the hills and valleys. You will only find gas stations in towns and near tourist attractions, so plan your refueling stops carefully. You can visit sugar camps and stroll the streets of Monterey and McDowell for free. Pancake breakfasts, which do cost money, begin at 7:00 a. m. in McDowell, Bolar and Williamsville, 7:30 a. m. in Blue Grass and at 8:00 a. m. in Monterey. Dance and music performances kick off at noon. Ham, trout and other specialty dinners are available from 11:00 a. m. to 5:00 p.m. in McDowell, while Monterey's afternoon food options include beef, ham, hot dogs, burgers and trout sandwiches. Craft shows charge $3.00 for one day's admission. Street vendors and local shops sell their wares, including maple syrup and fresh maple doughnuts, during daytime hours. This is a very, very popular festival. Expect crowds. Drive carefully in towns and watch for pedestrians. Plan ahead – several months ahead – if you want to stay overnight in the local area. Most hotels and bed and breakfast inns charge extra during the Maple Festival. Spring weather in Highland County is very unpredictable. Bring shoes that can stand up to mud, snow, ice and uneven terrain. Dress warmly and wear layers. The festival is spread out around the county. Check the weather forecast before you set out. If it has been raining or snow has recently melted, you may have to park on muddy ground, particularly near sugar camps. Sugar camps are located outside of Highland County's towns, so you will need to drive to the sugar camp. Admission to the craft shows is $3.00 per day; you pay once and can come and go as you please. Maple doughnuts are highly-prized food items here, and they are nothing like the doughnuts sold by national chains. Locals will tell you that the buckwheat pancakes with maple syrup are not to be missed – and they are right. Don't be surprised to see people flavoring their coffee with maple syrup, too. Sugar maples abound in Highland County. 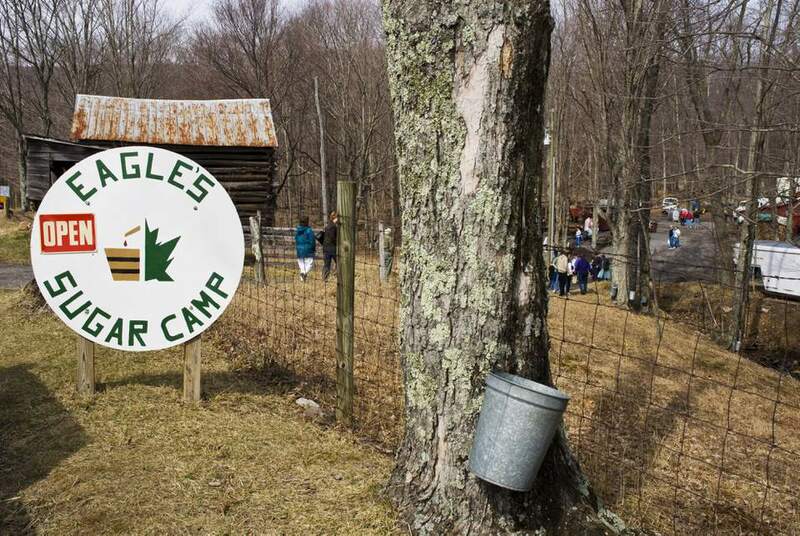 Each spring, as the sap runs high, the county's sugar camps open for business. The Highland Maple Festival showcases the syrup-making process and gives locals and visitors an opportunity to celebrate the county's heritage, including music, dance, art, crafts and, of course, maple syrup. Pick up a sugar camp map – you will find them all over Monterey and McDowell – and drive out to one of the sugar camps. Here you can learn how syrup is made and see the vats of boiling sap. Of course, you can buy syrup if you wish, either at a camp or in one of the towns. Don't miss the craft shows if you love handmade items. Artisans from near and far show off their wares inside the county's school buildings. Another group of crafters sets up at Monterey's courthouse lawn each year. For many visitors, the food at the Highland Maple Festival is the main attraction – ham dinners, trout, funnel cakes, barbecue and stacks of fluffy buckwheat pancakes drenched in maple syrup. Try some of the local specialties; you'll quickly be convinced. Take home a box of maple doughnuts and start making your plans to attend next year's festival.